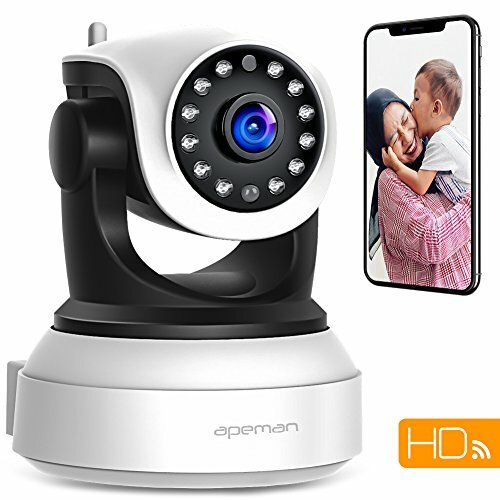 Apeman wifi security camera covers a 12-months warranty. Replacement service within 60 days. Back up by efficient customer service team and professional tech support. Please don't hesitate to contact us by: support.us@apemans.com. Your satisfaction is our mission. 【Reliable WIFI CONNECTION】 Easy setup via mobile App "EyeCloud" on your smartphone.Stable 2.4GHz WIFI connection. Compatible with Android/IOS. Can be used when you're not home via 3/4G data or other wifi network. (Camera needs to be plugged in power source.) . 【Secure Privacy】Support WPA2-encrypted wireless network. Remote monitoring technology based on servers with https communications protocol. Ensure information between user and site/servers cannot be read or forged by any third party. Free replace service within 60 days. 【720P HD Night Vision】1280*720P bright HD image in daytime. Record clear black and white image even in total darkness with 12 IR Leds. Night vision up to 32 feet in pitch darkness with no light pollution. 【Wide Angle & Smart Monitor】355°pan and 85°tilt covering wide range. Swipe on device screen to see different views. Monitor every corner of your home. Advanced motion sensing technology. Alert notification sent to your phone upon detection, you can click to jump into real time video and check out what's going on. 【2-Way Talk】 Built-in anti-noise filter for a clear 2-way Audio experience. Talk and listen to your families or friends through mobile device and IP camera.